As you can see in the initial photograph, the spice is a rather non-descript beige colored powder. There is not a very strong aroma by any means. Some have described as being somewhat honey-like, but I find it more like maple syrup, or the sweetish, faintly maple quality of Fenugreek seed. The taste, on the other hand is more assertive with a definite tart fruitiness coupled with an underlying sweet warmth. Personally, unless knowing the origin of the powder, I would be hard-pressed to identify it as being made from mango. There is, as I say, a fruity quality, but it is composed of very generic and vague high-notes only. 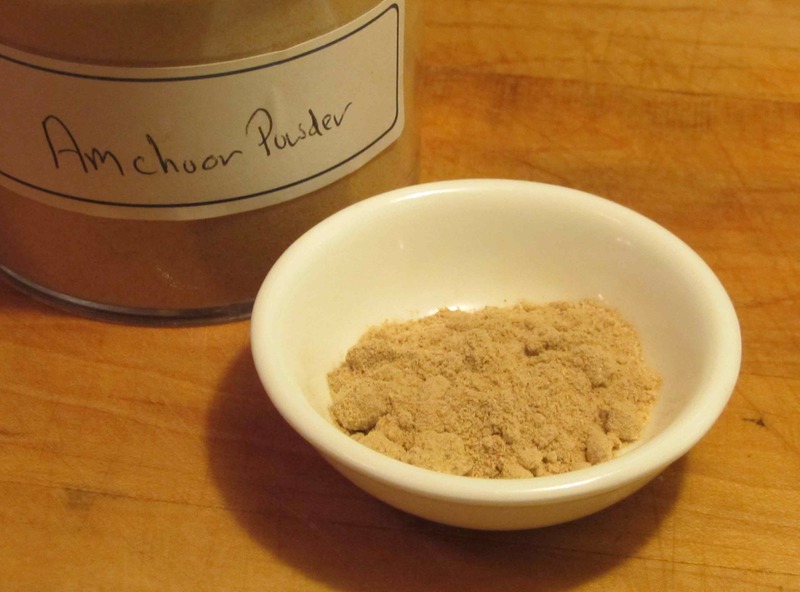 In Indian cookery, Amchoor is used to add a tart flavor to many foods much in the same way as Tamarind. It is added to many curries and soups and is very widely used in pickles and chutneys. The powder is sometimes used alone, being sprinkled on cooked vegetables or raw fruit, but one of its most common employments is in the spice blend known as ‘Chaat Masala’, which I will be looking at in some depth in an upcoming post fairly soon. Amchoor, as does the fresh fruit, is also known to have a meat-tenderizing quality as well as being added for its flavor. It is not as strong as papaya in this regard but the tenderizing quality is more pronounced than lemon or lime juice (up to three times stronger according to some estimates) and this should be born in mind when adding the spice to marinades for very delicate foods like shrimp, for example, whose textural quality can be degraded by over enthusiastic marinating. Basically, I just butterflied some shrimp (about 8 medium-sized ones) and then dusted them with a mixture of 1 tbsp. of Amchoor, 2 tbsp. of cornstarch, a pinch of salt and some ground black pepper. I then deep-fried them immediately and served them hot. My wife actually said they were about the nicest shrimp she had ever had (although that may have been that she was very hungry), but I liked them very much as well. Probably, in future versions, I would jazz the spice blend up a little, but doing it this way will give you some idea of the taste of Amchoor alone. I am trying to branch out and try new spices.. this is really helpful to read! I only use it from timie to time, but we always make sure we have some on hand. Hmm, wonder if I will be able to find this at our local spice store in town – sounds very interesting. I was thinking that you may be able to get fresh unripe mangoes in you part of the world. I’d like to try making the powder myself but, although we get mangoes regularly, they are generally ripe. If you give it a try, I’d love to hear your results. Despite living in the middle of nowhere, you always come up with ingredients I’ve never heard of before. Thanks for sharing! I bought this on one of my trips south… It’s something we usually have in the spice cabinet. I have a post featuring the powder in a spice blend coming up! You don’t need to cut deeply…. just an incision about 2/3 the way through from the back and then press down to ‘butterfly’. Wow! Not sure if I can find that here…..but would love to try it. 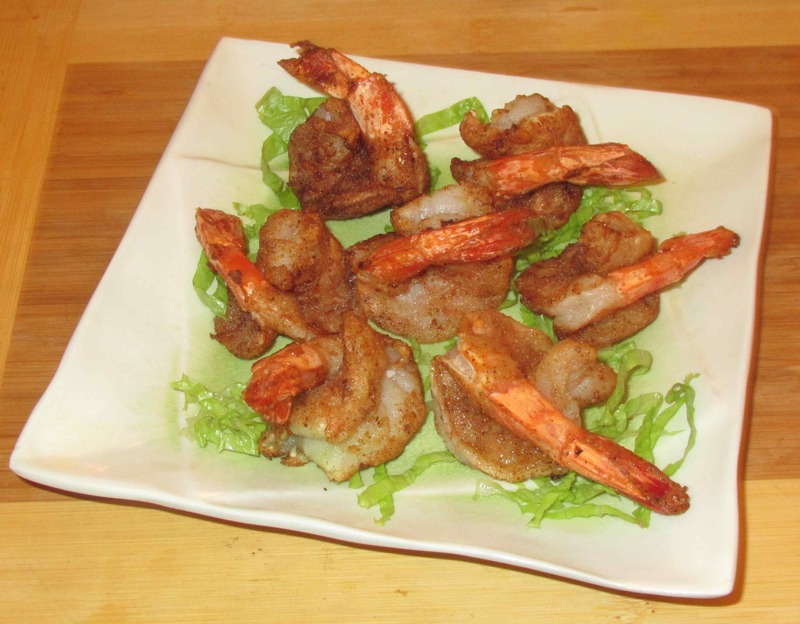 And I am so hungry….I could eat those shrimp in a heartbeat! Looks great! Any Indian grocery will carry it if you are lucky enough to be near such an establishment. Yeah … I didn’t let the shrimp ‘marinate’ with the stuff. A quick dusting and then fry straight away. That’s funny that you wrote about amchoor, I just bought a packet of amchoor powder a few weeks ago because of some recipes I found that include it. I’ll have to try it for shrimp, that sounds great. You’ll have to post the other recipe experiments! Your blog is such an education! If Darlene says it’s good, I have to try it!